The discussion concerning the temperature profile of an ideal gas under the force of gravity has a long history. There are many excellent texts on this subject so I will mostly refer the reader to these and just add a few comments of my own. "...According to Herapath, the force of gravity by itself produces a temperature variation in a vertical column of air, namely a decrease of about 1 F for every 100 yards increase in height above the earth's surface (assuming perfectly dry air); the 'total altitude of the air' would thus be approximately 31 miles, if it terminates when the temperature has dropped to absolute zero. Herapath's work was refused publication by the Royal Society of London but seems to have had ample publicity through its appearance in several issues of the Annals of Philosophy...."
This is so obvious so why do I mention it? Well, if we assume that the ground temperature of the earth is on average 288 K and that the temperature decreases by 9.8 degrees C per kilometer, then the atmosphere must "end" at an altitude of approximately 30 km, otherwise the temperature will become negative. Today we know that the atmosphere extends to much higher altitudes and that the temperature appears to be stratisfied beginning already at an altitude of 11 km. The stratification must occur at some point independent of any ozone absoption of UV-light and so on. Clearly, we must distinguish between the single particle kinetic energy expectation value and the ensemble average. The fact that the particles with low energy must reside at lower altitudes means that they contribute to lowering the ensemble average of the kinetic energy at these altitudes. Or put in other words, the density decreases according to the barometric formula just as the pressure does, so if the ideal gas law is to be valid the temperature must be uniform in the column. The problem can also be treated within the context of fluid mechanics under Navier-Stokes equations, yielding some similar but also some slightly different answers. The absolute temperature could be defined using the notion of equilibrium in the following way: Whenever two systems in thermal contact with each other but isolated from the surroundings cease to exchange net heat (energy) they share some common property called temperature. The absolute temperature can be given a number according to the formula 1/T = dS/dE where S is the entropy and E is the internal energy. In order to define the entropy we need to identify the degrees of freedom of the system. The kinetic temperature we define as the ensemble average of the translational kinetic energy of the molecules. This can only be applied to gases but is not excluded to ideal gases. Allowing the inclusion of water vapour and other gases with extra degrees of freedom does not pose any difficulties. The empirical temperature we define as the reading of some preferred thermometer. This definition differs from the others since it concerns the physical world and not "the world of ideas". Is, under all circumstances, T = T' = T'' ? Under all circumstances we have that T' = T'', but T = T' = T'' holds only if there are no greenhouse gases around. This of course requires that we treat the incoming sunlight as a heat flow regardless of the composition of the atmosphere. It appears as if the controversy concerning the greenhouse effect in relation to the second law of thermodynamics can be formulated as a logical/semantic disagreement of the kind just described. flows from a colder body (approx. -40 deg C) to a warmer one (Earth's ground approx. a wrong interpretation, since it ignores the radiation of the Sun (even 6000 K). With respect to the total balance the second law is obeyed indeed." There is something very strange about this statement since if we follow the advice given and treat the incoming sunlight as a heat flow then there is no net heat flow between the surface and the atmosphere averaged over a day-night cycle. Your argument, such as it is, contains several fatal flaws and self-contradictions. To pick a couple of the more obvious ones, first you misstate the assertions of the Coombes-Laue paper attached above, in fact you get them completely backwards. They write 'the kinetic energy of each individual molecule does decrease with height', while you write the opposite, viz. 'the particles with low energy must reside at lower altitudes'. Oops. More importantly, you've entirely misapprehended the principles of thermodynamics, which is something of a hiccup for any serious endeavour in climatology. Particularly, you define absolute temperature for a closed system in thermal equilibrium, then immediately start talking about 'incoming sunlight'. Which means you don't have a closed system. But, perhaps because you don't quite understand the terms you're using, you carry on regardless to your arbitrary conclusions. So I respectfully suggest that any logical/semantic disagreement you may encounter in this case is most likely between you and reality. I think what I wrote makes sense. Not every molecule is granted the same energy, but is governed by the Boltzmann distribution. C & L state that since each molecule looses energy as it travels upwards one might conclude that the kinetic temperature decreases with height. However, since the molecules with energy below E will never reach a height above the cutoff h = E/mg they do not contribute to the ensemble average at higher altitude than that. This as far as I understand resolves the apparent paradox. Moreover I problematize the question of the incoming sunlight, I guess one should begin with declaring whether one is considering the system to be in equilibrium or non-equilibrium before you enter a discussion of the contribution of greenhouse gases. This is rarely done. I have researched this issue extensively, as have others in more recent times, including Hans Jelbring who had a peer-reviewed paper published in 2002 in which he supported the conclusion that a gravity gradient does indeed evolve spontaneously in a gravitational field. 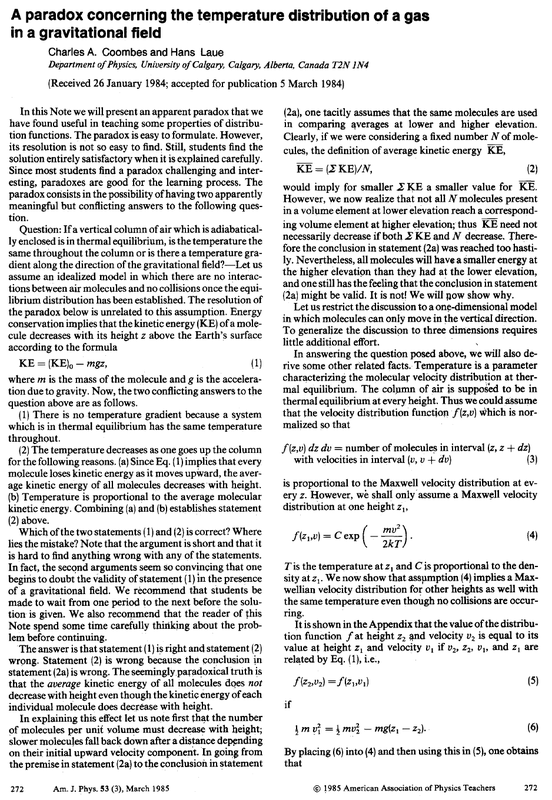 I have now written a 20 page paper "Planetary Core and Surface Temperatures" currently in the PROM menu (but soon the publications menu) at Principia Scientific International. You simply cannot explain how sufficient thermal energy reaches the base of the tropospheres of Uranus and Venus unless the gravitational gradient is a reality. I don't proposed to re-wire my paper here, as you won't accept a brief summary - and it needs the evidence and diagrams in the paper. (a) There is no issue about the top of atmosphere or the stratosphere or thermosphere. These are regions where new absorption of incident Solar radiation dominates the much slower process of diffusion of kinetic energy. Also, the thermal gradient (aka "lapse rate') is -g/Cp where Cp is specific heat. But specific heat is only constant at a constant pressure and temperature. So the gradient approaches a limit of zero and never goes negative. It also works in the outer crust and the mantle when you understand how much specific heat increases at the temperatures found in the mantle. (b) The paper by Coombes et al simply is not based on the Second Law of Thermodynamics. They quite incorrect assume thermal equilibrium is implied by that law. It is not, and nothing in the law implies that it must be. The law states the thermodynamic equilibrium will evolve in a state of maximum accessible entropy. From here you need to pick up from Section 4 in my paper which is easily found on Google if you include my name Cotton and the title in quotes. Thank you for highlighting these issues. I could make answers to some of your comments in the commentators field but I think this warrants a new blogpost. I hope to complete it in the next few days.